Take advantage of recreation opportunities such as an outdoor pool or take in the view from a rooftop terrace and a garden. Additional features at this hotel include concierge services and an arcade/game room. Getting to nearby attractions is a breeze with the area shuttle (surcharge). This city hotel is situated just 10 metres from Ponent Beach and right next to the marina. 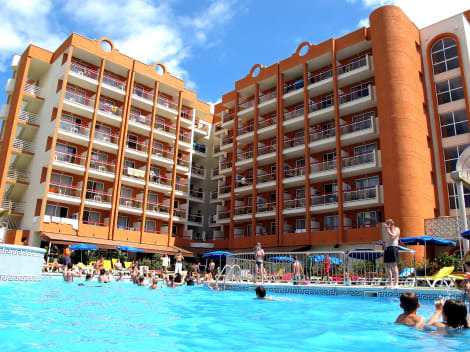 It is jsut 200 metres from the centre of Salou, one of the most attractive towns on the Costa Dorada, where guests will find numerous bars, restaurants, shops and both bus and train stations. Reus is approximately 11.3 km from the beach hotel and Tarragona is around 12.4 km away. Barcelona-El Prat De Llobregat airport is roughly 85 km from the hotel and Reus airport is just 11 km away. The air-conditioned hotel offers 63 rooms in total and welcomes guests in a lobby with a 24-hour reception, hotel safe and lift access. Further facilities include a garage, à la carte restaurant, cafe, TV lounge, bar and children's playground. Guests may also relax in the gardens and take advantage of the conference facilities, WLAN Internet access and a laundry service. Each guest room features an en suite bathroom with a bathtub and hairdryer, a double or king-size bed and a terrace overlooking the sea. Other in-room amenities include satellite TV, air conditioning, central heating, a telephone, music, safe, minibar and Internet access. The hotel has an outdoor swimming pool with children's swimming area and a poolside snack bar (fees apply) with sun loungers laid out for use. Guests may also relax with a massage or enjoy a game of beach volleyball. Water sports available on the sandy beach for additional fees include waterskiing, diving, surfing, windsurfing, motor boating, banana boating, sailing, catamaran boating, canoeing and pedal boating. Port Aventura Golf Club is approximately 3.9 km from the hotel (fees apply). Buffets are served for breakfast, lunch and dinner. Guests may also select their lunch and dinner from set menus. Featured amenities include a computer station, dry cleaning/laundry services, and a 24-hour front desk. A shuttle from the airport to the hotel is provided for a surcharge (available 24 hours), and self parking (subject to charges) is available onsite. Make yourself at home in one of the 288 air-conditioned guestrooms. Rooms have private balconies. Wireless Internet access (surcharge) keeps you connected, and satellite programming is available for your entertainment. Bathrooms have showers and hair dryers.